Lens Cleaning Pens — Are They All the Same? The LensPen lens cleaning system known to many is designed by The LensPen Group in Vancouver, Canada, and is produced in their factory in China. It is a major step up from the previous approaches to cleaning finger prints and smudges from lens surfaces — usually involving a cloth with properties that would (hopefully) absorb the amino acids and fatty acids in most finger prints and smudges without simply smearing them around. What was it that made this product so popular so quickly? Our research suggests that it was a combination of carbon black and hydrated calcium sulfate. Carbon black is another name for soot and it works its miracles through the same means that makes charcoal so effective in activated charcoal water filters, the principle of adsorption. Many of us still use the old trick of washing windows and then drying them with old newspapers to produce sparkling, clean glass. This has historically been an excellent approach due to the carbon black used in the ink used to print the newspaper. These lens cleaning pens are simply a new approach to an old technology! Because it was such an improvement over what was previously available, the company found a large number of companies wanted to have LensPens manufactured with their name displayed on it. A partial list of OEM and private label customers on the LensPen site shows brand names such as: Nikon, Bushnell, Cabela's, Leupold, Jessops, Schmidt & Bender, Pentax, and a number of others. 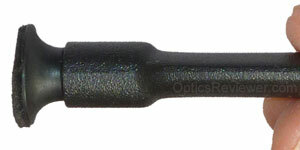 When we compared their appearance and pricing, we concluded that the enormously popular "Nikon Lens Pen Cleaning System," as well as the Leupold lens pen (or Leupold LensPen, depending on where you read it), and the Vortex lens cleaning pen were all identical to the original LensPen except for the brand name on the product. And why shouldn't they be? It was a significant advancement and everyone wanted to be associated with it! Carson Optical saw how useful the LensPen products were, but also noticed some of their shortcomings. For one thing, the carbon black used was not as effective as it might be. The shape of the cleaning tip was not optimized. The rubber used tended to be stiff. Things that we had also noticed when we were trying to clean water spots from our lenses! Before we get to talking about improvements in the basic product, though, let's consider some things that are helpful to know about lens cleaning pens and perhaps to clear away some misperceptions. First let's talk about lens cleaning pens in a general sense. Both the LensPen and Carson cleaners use a carbon-based adsorbent. If you brush them against something light colored, they'll probably leave a smudge. If it's a fabric, the smudge may be difficult to remove. That's normal and it won't bother your lenses. The black stuff leaving the smudge is what soaks up the oils in the fingerprints and smears. Of course, rubbing the lenses with anything will, over time, have an impact. Don't clean your lenses when they don't need it! For those who are accustomed to using lens cleaning solutions and tissues, it may be disconcerting at first to find that the carbon-based cleaners are not damp! Positive experiences usually overcome this, however, and we quickly became accustomed to the "dry cleaning" approach. We don't use these cleaners on wet surfaces. We think the water would affect the carbon's qualities as well as likely turning the chamois used on the LensPen's tip stiff and hard. A stiff chamois would be likely to scratch your lens coatings, if our car washing experience counts for anything. Using tiny little circular movements on a lens will often be frustratingly inadequate in cleaning. It's more effective to use a larger circular movement starting at the outer edges of the lens and work toward the middle. The tiny circular movements will often only result in smudging, whereas the larger circular movements will expose more of the carbon cleaner to the surface and do the job for which we bought it. When the lens cleaners are new, there's small chance that the cleaning tip might have some "extra" of the carbon-based cleaning compound that might be left on a lens. We consider that this demonstrates that we got our money's worth on that particular cleaner and just blow the excess off our lens or, if it doesn't blow off, we lightly brush it with a lens brush. If this happens more than once or twice, sharply tapping the cap upside down on a clean piece of scrap paper usually dislodges any excess there and the cleaning tip can be pressed on that same paper to remove excess. The lens pen cleaners include a retractable soft-bristle brush that's not incorporated into Carson's disposable cleaners, although the 12-pack of Carson disposable cleaners does include a brush. Use the brush to clear away dust or larger particles on your lenses before using the cleaning tip. We can help you learn from others' experiences by telling you not to handle the brush with your fingers. This is because it will pick up skin oils which it will then smear on your lenses. (Yes, we know the bristles are soft and it's a terrific temptation to play with them!) In fact, it's better to put the cleaner into clean, small plastic bag before putting it into your binocular or camera case, pack, or shirt pocket. 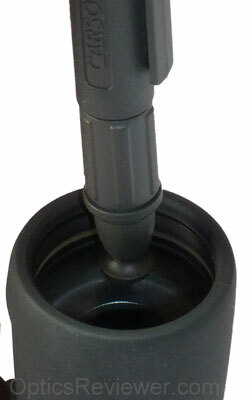 The end of the retracted brush is not covered and can accumulate small amounts of oils or debris that can affect its cleaning ability. Lens cleaning pens are not marketed for, and we don't think they should be used for, cleaning the inside of a camera or a sensor. Those are projects for different tools. Particularly when new, the chamois used by LensPen for the cleaning tip would shed small particles. For the uninformed, those particles may seem to indicate that the lens is perhaps dirtier after the cleaning than before. Simply blow or brush the particles off the lens and you can continue using your optics with joy and delight. Of course, this is not what you would start a cleaning job with if your binocular had been dropped in the mud! That would be an entirely different matter! This is for cleaning dusty debris and fingerprints&sol;smudges and it does an admirable job in that regard. 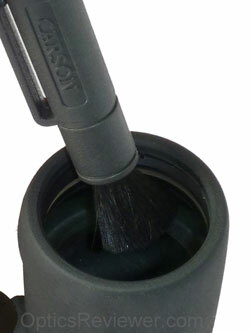 One thing that we'd like to see is a cap for the retractable brush's end of the lens cleaning pens. It seems to us that it would go quite a way toward keeping the brush clean and serviceable. Would we pay more for such a cleaner? We would probably balk at paying a dollar more, but we would be willing to pay a reasonable amount for the benefit it would provide. What Do We Use to Clean Our Lenses? We like the LensPen and have enjoyed using it over a period of time. It cleans nearly anything on a lens from watermarks (a fine mineral residue left when a drop of water dries) to fingerprints and smudges from who-knows-what. We've found, however, another product that we like even better. We were using a LensPen to clean watermarks from a lens when we first realized the difference. The LensPen cleaned most of them with what we felt was a reasonable amount of effort, but one or two stubborn ones remained despite what we felt were the LensPen's valiant efforts. The Carson cleaners were introduced to the market in December 2011. We had one of their disposable lens cleaners that we'd not used much and we decided to give it a shot at the stubborn watermarks. We were pleasantly surprised when it cleaned them off with less effort than we'd been using with the LensPen on the "easy" watermarks! With that, we started using the Carson disposable lens cleaners more and more often and were pleased with the results we saw. 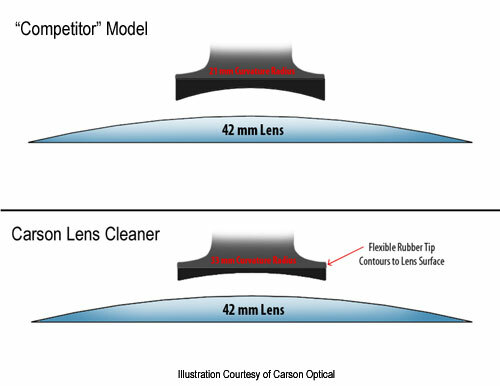 What's Different About the Carson Lens Cleaners? They tell us that one of the improvements their lens cleaners have is the use of a different form of carbon black than the LensPen uses. It has smaller particles and is the reason Carson refers to it as their "nano-particle cleaning formula." They tell us that the smaller particles mean more absorptive ability and that makes sense. The greater absorptive ability means more fingerprint oils are picked up on the first pass with their cleaners — which is certainly logical. Another Carson improvement is the rubber used to hold the pad that actually cleans the lens surface. The Carson cleaners use a softer rubber that adapts to the curvature of our lens more readily and makes cleaning easier. A third Carson improvement is using a 33mm radius curvature for the cleaning surface while we understand the LensPen's cleaning surface has a 21mm radius curvature. That greater radius curvature, along with the softer rubber mentioned above, means we don't need to press as hard with the Carson cleaners as we have had to with the LensPen. That suggests to us that it's easier on the lens coatings than the LensPen and that our binoculars' service lives will be extended by using the Carson lens cleaners. Finally, the LensPen is good for about 300 uses and the Carson folks figure a person should be able to get about 600 uses out of one of their lens cleaning pens (not the disposable cleaners, but the ones with retractable brushes). That just seems like a good value to us. 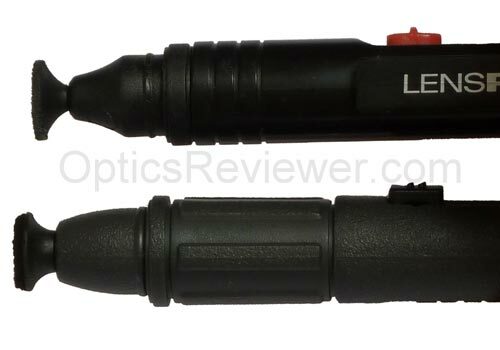 We've had good experiences with both the LensPen and the Carson Lens Cleaning Systems. We like them both, but we prefer the Carson cleaners when it comes to cleaning our binocular and camera lenses. They also work on GPS, mobile phone and computer screens. In fact, Carson has large cleaners just for getting things like fingerprints off our computer screens! In North America, you can find the LensPen products under their own brand name (as well as the Nikon branded "Nikon Lens Pen Cleaning System" if you do a separate search) at Amazon.com . In the UK it's available at reasonable rates on Amazon.co.uk . They're not at all a bad product and we've found most people like their convenience. To check out the Carson lens cleaners, our favorites, use these links to go directly to the selections at Amazon.com (USA) and Amazon.co.uk .